It’s a miracle I lived through the 60’s and 70’s. As if Richard Nixon, Vietnam, mutually assured destruction, and really really bad fashion weren’t risky enough, I faced the daily threat of mass-marketed toys that could maim, wound, and disfigure. Mattel? Kenner? Hasbro? Whamo? Endless fun with just a hint of mutilation thrown in for good measure. The children’s playthings of my youth would never make the cut nowadays – but how dear they were to my heart way back when. 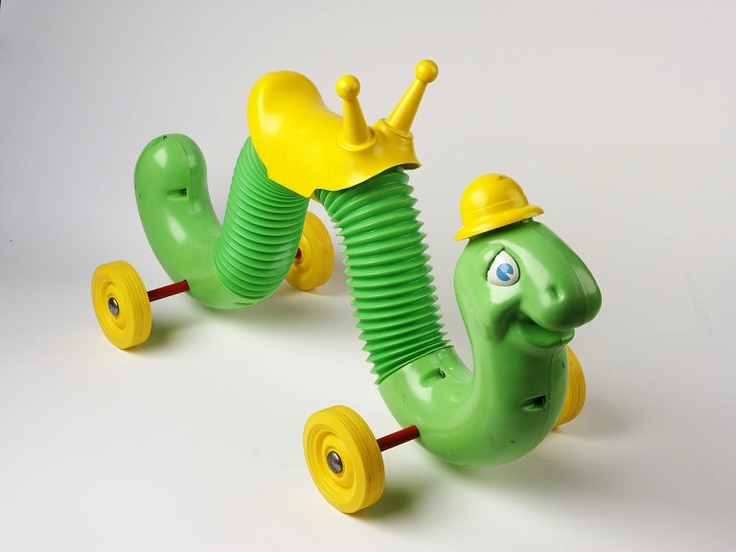 Toy’s of my childhood – how do I love thee? Once you’d worked up a healthy buzz from sniffing and snorting some of the good stuff above, it was time to get down to real business. If you weren’t holding a steel rod at 373 Kelvin, you weren’t having fun. I guess ‘Red Hot Iron Poker’ wasn’t very marketable. 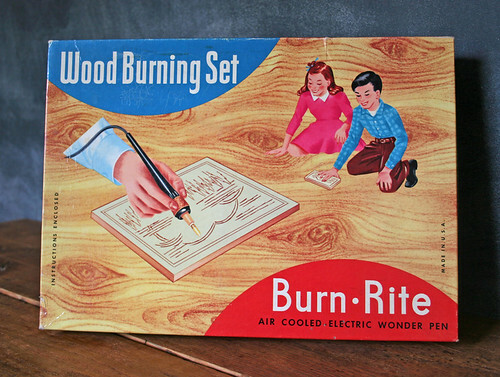 Instead they called this fun-filled item a Wood Burning Kit. Designed for the youthful artiste to trace lovely designs in the smooth face of a virgin wood canvas, we found it much more fascinating and gratifying to see which of our sister’s toys was combustible. The fun lasted until we ran out of things to ignite, or burned the hell out of one of our fingers. The Wood Burning Kit had the added benefit of giving off some more occasionally toxic fumes, a plus if the headrush from earlier fun had worn off. 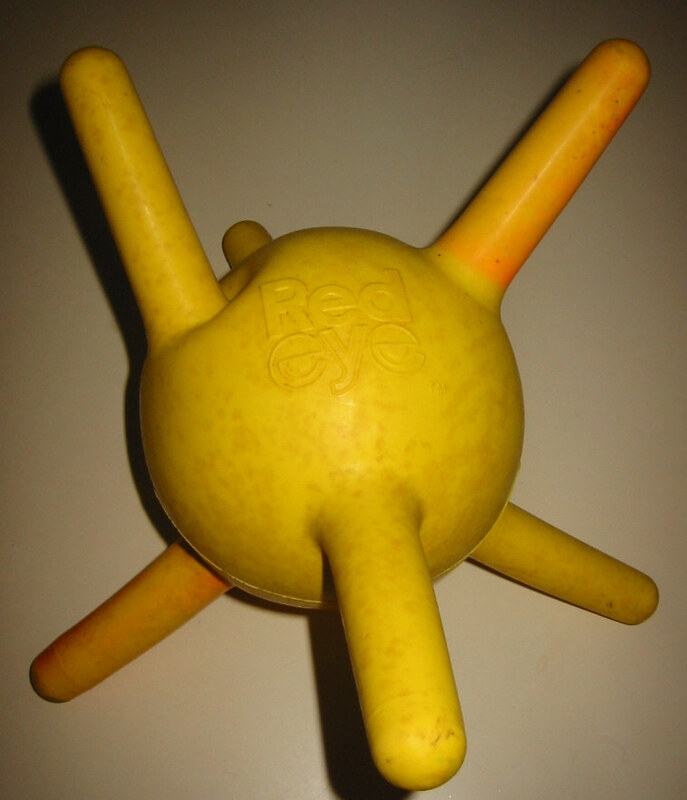 One of the most memorable toys of my youth had the potential to deliver fun and 3rd degree burns simultaneously. Creepy Crawlers let you make your own multi-colored rubber bugs and reptiles by squeezing some liquid goo into a metal mold you then placed in an electrically heated bath of incredibly hot water. The mixture of high-voltage electricity, water, toxic goo, and blazing heat was intoxicating. I can’t remember what the hell we did with the rubber bugs, but making them sure was fun. 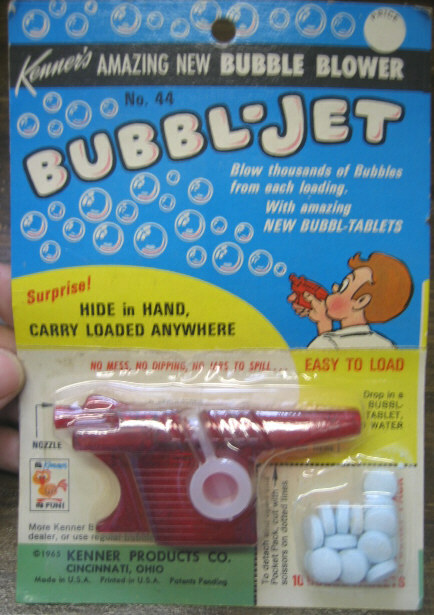 If you were really adventurous, you got the Incredible Edibles version which combined the above risks with ingestion of the finished (supposedly ‘edible’) product, creating a high-risk toy twofer. What a bargain! 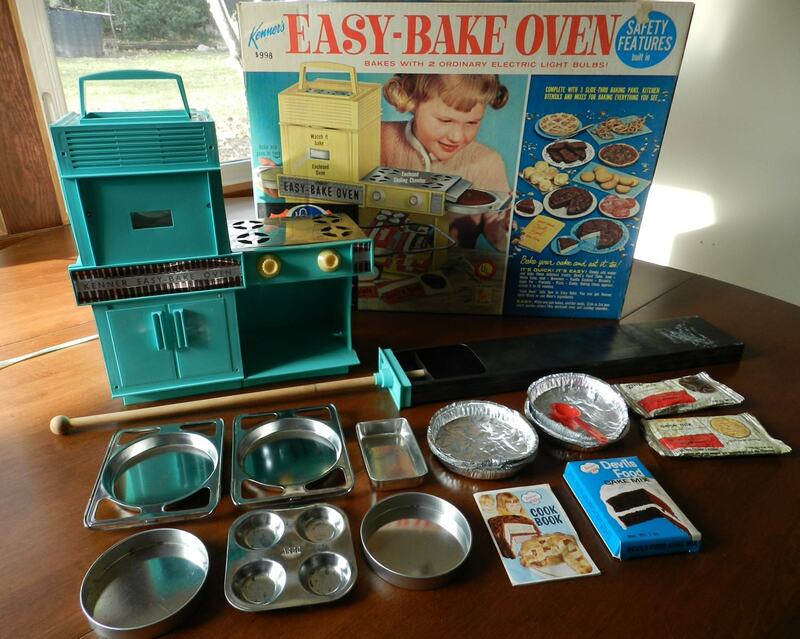 For the girls, there was always the classic Easy Bake Oven, which delivered the potential need for skin grafts using only the power of a light bulb. But the little brownies were really good, which did help take your mind off the burns. Finally, for the truly ambitious kids, there were Estes Rocket Kits. 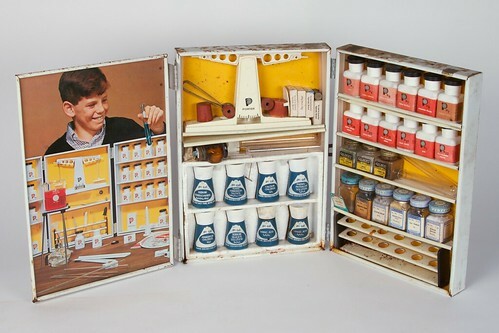 You spent weeks carefully assembling the model rockets, inserting the real solid fuel engine, and then painstakingly preparing your rocketship for blastoff. 3 weeks of work was over in seconds as your rocket blast off into the great beyond, usually never to be seen again. After a few launches, we naturally progressed to the next logical step – laying the rockets on their side and launching them down the street. We were among the most popular kids in the neighborhood. Finally, we’d tire even of bothering with the rockets at all, and would tape the engines to handy household items (like empty glass Coke bottles), and fire them off that way. Good clean American fun! We damn near did, on multiple occasions. Back then, the federal government was too busy alternating betweem idealism and corruption and fighting wars in obscure corners of the world to worry about what little kids were playing with. One of my elementary school playmates, Bonnie Higham, had one of her eyes put out with a dart thrown by her brother. As I recall, even for an elementary school girl, Bonnie was pretty hot, although it could be a little disconcerting to see her lovely little blue glass eye drift off in an unintended direction while the other one stared piercingly right through you. 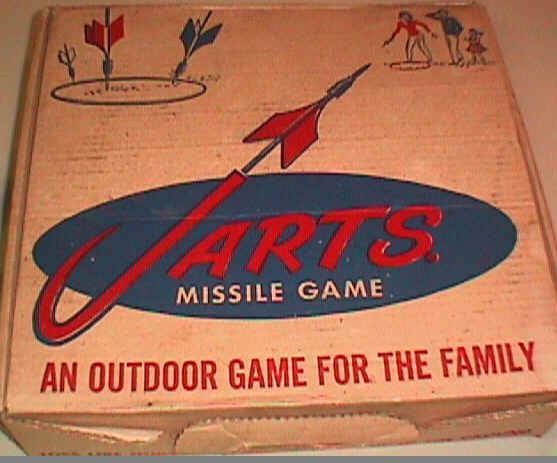 If the loss of an eye wasn’t gamble enough for you, you could risk full-on skull impalement with the big brother of the dart, Jarts, more commonly known as ‘lawn darts’. These bad boys were big enough to do serious harm, and were so tempting the adults usually absconded with them. Add in a little alcohol and adult klutziness, and you had a recipe for madcap fun or tragedy, depending on your luck. And of course, we had that old suburban standby, the Daisy BB Gun. When we tired of shooting at squirrels, crows, and the windows of neighbors we didn’t like, it was only a matter of time before we turned them on ourselves. Lets face it. We had it coming. There were other less forboding weapons at our disposal. The Fli Back Paddle was a personal favorite. It made a great weapon with a nice stand-off distance, giving you a headstart should whomever you were pummelling in the back of the head decide to counterattack. 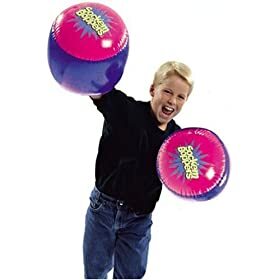 It also offered the risk of it’s hard ball slapping into your own face if you weren’t careful, or the rubber band breaking, sending the projectile off God know’s where, destined to break a family heirloom of some kind. If you wanted to take the hostility up a notch, you could call the Red Eye Ball into action. A modern day mace, its hard stubby prongs were nearly lethal when thrown at maximum velocity. Finally, a favorite weapon in many a childhood arsenal was the Johnny Reb Cannon, which hurled hard plastic cannonballs at those damn yankees with almost frightening fury. I wish I’d lived in a land of cotton. It’s amazing any of us escaped our childhoods without traumatic brain injury. 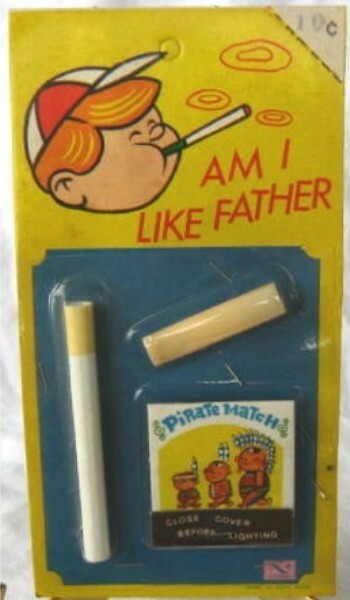 Even the most basic of toys in my day had the potential to maim. One of my favorites was the boomerang. 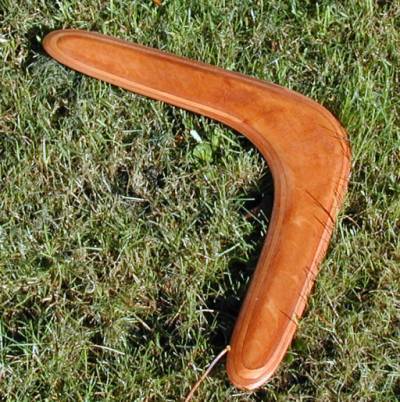 Ironically, even then people knew that the boomerang was a traditional Australian hunting weapon, but you could still find one in your stocking at Christmas. It could take years to master the perfect boomerang throw, seeing it make its swift, sweeping, beautiful arc and begin to race back to you and its point of origin. It took only seconds to realize you had no idea what to do about it as it careened towards your head at 90 mph. Run for your life! All of us remember the joyful glee of a slumber party pillow fight. So it was no wonder marketers of that era sought to capitalize on those misty memories with Sockem Boppers. The nostalgic rememberances of pillow fights past quickly faded as you were thrashed about the head and shoulders with a couple of thunderous right crosses from Brian Elkins, the big mean kid down the street. ‘Knock Em Senseless Boppers’ might have been a more descriptive moniker. Sometimes, you didn’t need anyone else at all to experience major head trauma. In the pre-rollerblade era, a common instrument of death known as the Strap-on Skate could be spotted on almost any sidewalk in America. After the hour it required to apply the strap-on skates to your Buster Browns or Keds, using your special ‘skate key’ to tighten them, you were in for the ride of your life. Everything usually went just fine, until you happened to hit a rock or stick on the sidewalk, at which point all bets were off. The skates had an interesting tendency to simply come off at any given moment. The only saving grace was that the maximum speed obtainable with skates on was about what you could muster at a quick walk normally. Fortunately, all kids of that era were urged to always wear their special protective headgear when skating. We called them ‘baseball caps’. If you’re going to ride to your death, why not do it with a really bitchin’ set of wheels? That’s my life philosophy anyway. Having the misfortune to have turned 10 years old on 24 April, 1972 P.B.W. 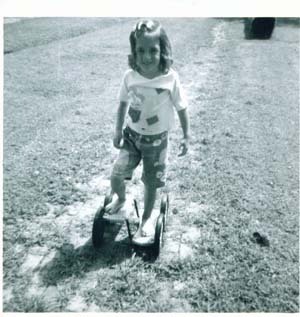 (Pre-Big Wheel), I was robbed of the opportunity of sporting a truly stylish and functional ride. Alas, our vehicles were lame, and generally dangerous as hell. The most hazardous of them all was the ominous-looking Skat Skoota. A set of 4 wheels, with 2 plastic red footprint pedals, Houdini himself couldn’t have successfully escaped its clutches. Besides, even if you did manage to traverse down the street on the thing without breaking your neck, you looked decidedly uncool doing so. Bummer. Inch Worm. The vehicle itself was perfectly harmless. But if you were spotted riding the ridiculous thing, your safety could not be guaranteed. It could take until High School for your rep to recover. The only plus was the catchy inchworm jingle. In fact, our choice of rides back in the day were so woefully inadequate, we were forced to create our own. In its lowest form, this might mean stilts made out of a couple of baked bean cans and some laundry cord. But my most memorable vehicular experience involved 2 childhood buddies, twins, David and Eddie Reynolds. Using plywood, and nails (lots of them), on top of a Radio Flyer wagon chassis, we erected a monument to transportation unrivalled to this day. We shaped it’s side’s like a lemon, even painting it bright yellow as the final glorious finishing touch. Carefully we hauled it up to the top of Larkspur Drive, which happened to be the steepest point in our neighborhood. Eddie, being none too swift upstairs (if truth be told) drew the lucky straw as our primary pilot. Into the lemon car he went. The fateful countdown began, and with a gentle push, he headed down the incline, gathering speed as he went. As our creation plummeted downward into the abyss, we suddenly realized our heady plan had but one fatal flaw. 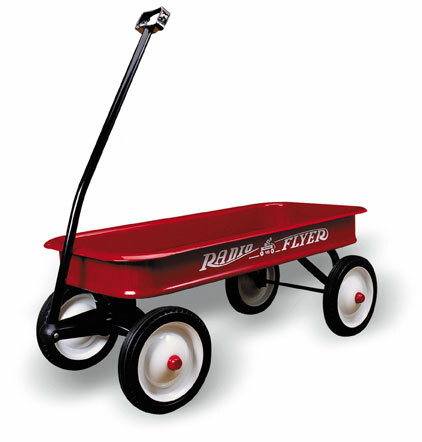 You couldn’t steer a Radio Flyer wagon. When the lemon car hit it’s max speed of 25 mph, it decided a 90 degree turn was in order. The plywood, nails, and Eddie Reynolds decided, however, to continue down Larkspur Drive. It was not a pretty finale. The lesson? We didn’t need toys to be dangerous. It came naturally. I both rejoice and recoil at the typical childhood activities we embraced back then. When my brother turned 10, he got an archery set and target for Christmas. We routinely fired real arrows at high velocity past each other’s ears. Exhilirating, amazing, and ummmm….kind of stupid in retrospect. I’d never let my kids do likewise, but still wonder if they aren’t missing some essential life training from the safety of their X-Box and Play Stations. I’ve shared with you the hazards of my youth. Next time, I’ll regale you with tales of some of my favorite toys. Maybe if I’m really really lucky, you’ll share your memories too. Don’ t forget to talk about our entomology phase! Do you remember the time that you and I were looking for salamanders or worms, can’t remember but we got into a green hornets nest! We ran faster than I ever thought we could and then some! Much of my survival during those two decades were due to my parents. “John, what are you doing?” My reply, “Nothing.” How the Hell did they know “nothing” meant “something I shouldn’t be doing”?